What amounts to a two-foot shift and six-inch riser will tack $200,000 on to a redesign of the beach access stairs and landing at Agate Street, says project director Wade Brown. Peter Mann, who lives near the Agate Street access, has devised alternate plans to increase public viewing areas. 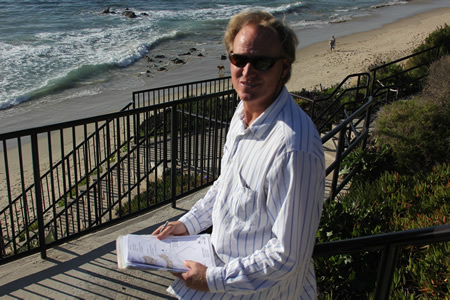 The appeal of the project initially signed off by the Design Review Board by Laguna Beach resident and former engineer Peter Mann was granted by the City Council on Jan. 10. It’s the end of a two-year battle for Mann over the proposal, which he said would have restricted views of the ocean and a southern arch and decreased functionality of the access point. The Design Review Board’s plan, which was approved in September, included realigned stairways, public viewing spaces, irrigation and landscaping plans. 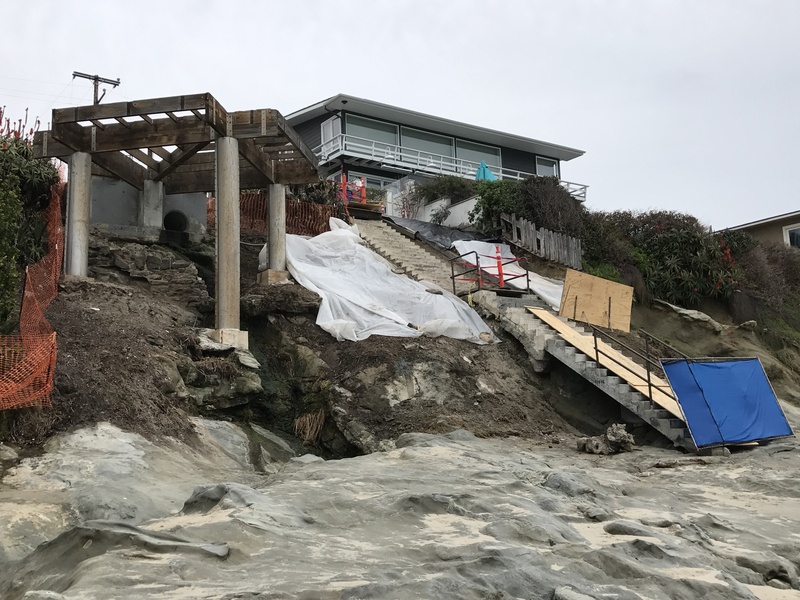 The Agate access point is one of several stairway replacement projects underway at beach access points that include Mountain, Thalia, Oak and Pearl streets. Oak and Mountain are currently under construction. But Mann contested that those five or six inches matter. His own proposal would raise the bench, not lower it, to preserve views. He also suggested no landscaping be allowed above the roof line of nearby homes, removal of a small seat that would be in the travel path of the stairs, and shifting the stairs two feet. Mann says the fixes would ensure easy maneuvering of crowds and large surf boards around stairway bends down to the beach. Council member Steve Dicterow concurred. The council granted Mann’s appeal, and stressed that compliance with the Americans With Disabilities Act in the design is a high priority. Brown said the Design Review Board was willing to take Mann’s suggestions and head back to the drawing board. “In the spirit of cooperation we are going to figure out a way to do that in the least costly way we can do that and make that happen,” Brown said. “I am going to guess we are going to need another $200,000. We are at $750,000 now and will be right around the million mark when we go to bid,” Brown said. Mann doesn’t understand the price tag. Brown did not give a break-down of the increased costs, and City Manager John Pietig was quick to remind the council they would not see the plans again before the project is ready to be built. “The next time you will see it will be when we recommend the award of bids. Just making sure we’re all on the same page,” Pietig said. – Apparently the team that created the original design must have never thought to look a few inches to either side to consider if there was a better choice. They missed it by half a foot. – The suggestion that “No landscaping be allowed above the roof line of nearby homes”, stated differently, could sound like “No landscaping allowed above the tops of the highest windows of nearby homes.” So much for sparing their million dollar views that are already existing. – Stressing that compliance with the Americans With Disabilities Act is a “high priority”? There are no priorities. You are either compliant or you are not. Had the original designers missed this also? Or, is it simply a way to get people to start to think it will be a costly project. – And right on cue comes a “guess” of an additional $200,000 on top of the already million dollar project. Arrived at through figuring out the least costly way to make it happen. Because they said so. – Certainly they would have no comprehensible reason not to provide the break down of these increased costs, since they created them. Yet they will not. – And not only that, the entire project is apparently being secreted from the council until the project is READY to be built. WHEN they recommend the award of bids. Otherwise known as too late and too bad if the cost “guess” just happened to be substantially off and all the ADA hardware is made of gold. Of course, the council could most likely look for itself anyway. At least until being “reminded” they all better be on the “same page”. – And wonderfully, there have been specific instructions to specifically specify that they should “spare no expense”, otherwise known as “spend as much as possible”. And of course if you are going to go all out on a city project, a lightly used stairwell would be the logical spot. Although all those bare feet may not be good enough to walk upon it. Civil Engineer, Peter Mann, who is professionally, technically and intimately familiar with the project “doesn’t understand the price tag”. The changes “should have NO cost bearing whatsoever”. Lucky contractor, though. Although I’m just guessing they’re lucky. My guess could be way off.